Last week we had the privilege of hosting some very dear friends of Eric’s from Lake Grove Presbyterian Church out of Portland, OR. Many of the team of 10 had been to Senegal on numerous short term mission trips and it was very clear to see their deep ties and relationships that they have developed in this country. 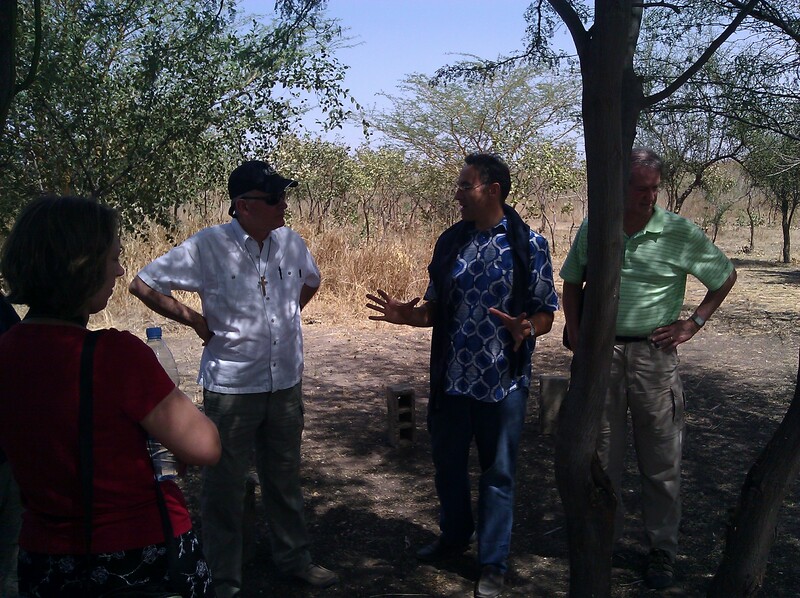 Pastor Bob Sanders, who was leading the trip was very moved by the vision we have been given for Beer-Sheba and although he has heard about the project in words, being there in the midst of the project, gave him a new appreciation for the task at hand. We started the day by meeting them in Sandiara, where we give them a brief tour of our future office/guesthouse building. Then we were off to the project, 7 km south of Sandiara. We started by explaining the main differences of regeneration vs. reforestation and how they both have their place in an agro-forestry context, but noting that regeneration is definitely the more successful and sustainable approach to foresty in the Sahel region. 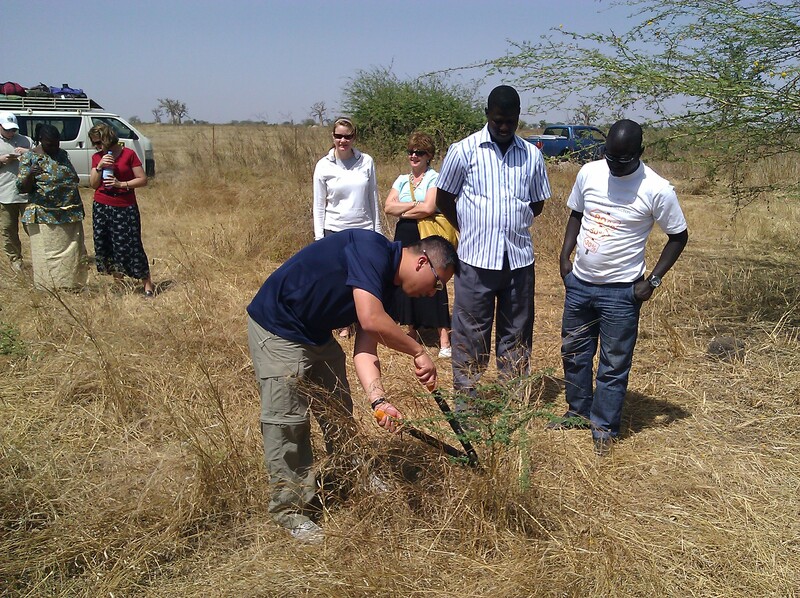 Members of the team were given the opportunity to practice (or learn) the very simple skill of tree pruning. When we prune very young trees, it takes under a minute to get rid of all the secondary branches, and by doing this simple process, it is has been demonstrated that you increase the value of the tree by 2 or 3 times! Amazing return on a 1 minute investment. So, needless to say, we cannot stress the importance of managing this regeneration for the benefits of the project and surrounding communites. We continued around the project where Eric explained the amazing “God gave us water” story and also described our dreams for building a solar field near the well where our electrical requirements will be the highest. Continuing on, with the chanting and singing of birds in the forest we came to the 7Ha area that has been set aside for our proposed drip irrigation, market gardening area. This area will be divided into 100 plots that we will lease to community members for income generation on a year round basis. The last stop we made was at the water basin which still has a fair bit of water remaining. This area is always teaming with wildlife and the birds are always very audible in their appreciation of a watering hole in the desert. We made our way back to the entrance where an amazing meal of fish and rice had been prepared by some ladies from Soussane, about 2 km away. Great fellowship was had by all as we sat around the bowl and we were doubly blessed to have some fresh ataya tea on brew to cap it all off. After the tea, we were on to Mbour where we got them all checked into a nearby hotel/apartment complex. It is right on the sea with beautiful views and amazing vegetation. They spent a few hours relaxing there and then we had the great privilege of hosting them all at our house for a wonderful evening of visiting, laughing, and enjoying good food. My wife Nicole and Eric’s wife Heesuk had put on a big spread and we had a truly enjoyable evening. 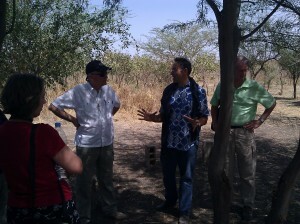 We are grateful to the group for taking the time to visit Beer-Sheba and encourage us. We have made some new friends in this process and we are looking forward to seeing how God will use us all together as we are obedient to His calling. We hope that the Lake Grove Church will make Beer-Sheba a yearly stop for teams, and a daily prayer item as we covet your prayers.